My friend Don Eitel posted a piece by Jeff Haden with this title that was published on LinkedIn. He chose great quotes from Steve Jobs, but drew the worst conclusions he could have from them. You can read his article at the link above, and I won’t critique it, but here is my analysis of the quotes. Not every idea is great, or marketable, but many are. New ideas are often greeted with confusion, ridicule or outright hostility. It takes guts to persevere in the face of those naysayers. It takes temerity to listen past the negativity of the naysayers to find the kernels of truth in what they’re saying that can improve your idea. And it takes wherewithal to wrangle the resources necessary to bring the idea to fruition. These are the components of perseverance that Jobs is talking about. There is still an enormous potential for failure, but those who move through successive rounds of guts, temerity and wherewithal are those who succeed. Most give up along the way. Success belongs to those who persevere. Success in business does not constitute success in life. As I wrote in my essay on sabbatical, burning the candle at both ends benefits neither your work life or your home life. 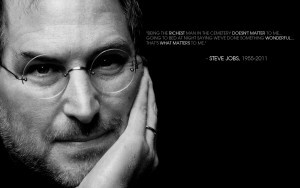 As busy as Steve Jobs was in the last decade of his life–as CEO of both Apple and Pixar–he worked to arrange his life so he could have dinner at home with his family every night. We work to live, not the other way around. Even if we have jobs or careers that we love, if we don’t take the time to live outside work, we may as well be Sisyphus pushing the rock up the mountain. The Beatles were four kids from Liverpool who happened to change the world because they believed they could. Harebrained, drug-addled ideas were forged in the crucible of the studio to create Strawberry Fields Forever, Hey Jude, and While My Guitar Gently Weeps and so much more. Sometimes the ideas were there, but the technical ability to achieve them was not. The Beatles’ genius lived in part in trusting the engineers, producers and others on the team to enable the full realization of the vision. In the case of While My Guitar and the Let It Be sessions, George’s genius was the realization that adding Eric Clapton or Billy Preston to the team would diffuse the tension among the team to let greater creativity flow. In the business case, it means recognizing that the core group of decision-makers may not have all the answers, and that adding trusted experts to the team as needed will provide better solutions and perspectives that will help give a fuller picture of a situation than a closed loop of deciders would have otherwise. The end result may well be due to the vision of the core group, but it is made more robust and richer with the addition of the outside input. No new idea arrives full-formed and ready to fly. You may know what your vision and ultimate goals are, but the path to get there is fraught with false steps and dead ends. The worst thing to do is to continue to run down a blind alley and waste time and resources on something that may have seemed like a good idea, but leads you away from your goal. Cut your losses. Find another path that will lead you to greater fulfillment of your vision. Honestly, this one needs no explanation from me. Clear, concise, on point. The work of a leader is difficult and requires perseverance, analysis, and a leap of faith that an untested vision will be accepted and fruitful. The work of a follower is simply to scan the field for someone else’s innovations and co-opt them for yourself or your organization. The risk is taken by others. The field has been tilled. There’s nothing inherently wrong with being a follower. It’s a hell of a lot safer than being a leader and innovator. But don’t mistake one for the other. I said that I wasn’t going to critique the original author’s essay, but I lied. His analysis was essentially a paean to working harder, not smarter. Essentially the opposite of what Steve Jobs was saying in these particular quotes. His B-school platitudes about choosing your customers and working through lunch are completely at odds with the quotes. If you read or listen to Jobs’s stunning Stanford commencement speech, you’ll find a philosophy very different from Haden’s: “Stay Hungry. Stay Foolish.” Do what brings you joy. Delight your customers/clients/patrons. Surprise yourself.